Sarah Nader- snader@shawmedia.com John Marty Becker takes a selfie with the graduating senior class before the Woodstock High School commencement ceremony Saturday, May 16, 2015. 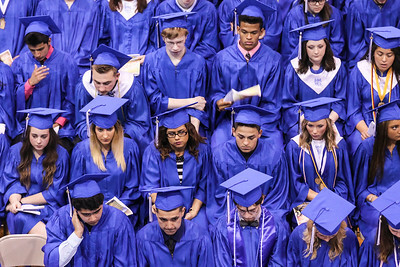 Sarah Nader- snader@shawmedia.com Graduates listen to the valedictory address during the Woodstock High School commencement ceremony Saturday, May 16, 2015. 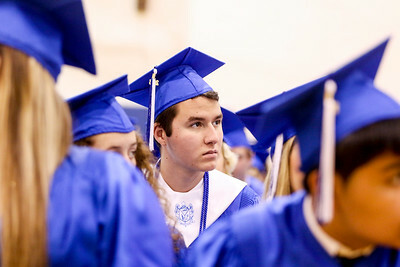 Sarah Nader- snader@shawmedia.com Jacob Clute waits with his classmates before the Woodstock High School commencement ceremony Saturday, May 16, 2015. Clute plans to study computer Science at McHenry County College after high school. 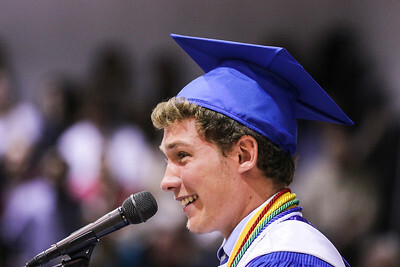 Sarah Nader- snader@shawmedia.com Valedictorian Jack Fischbach speaks to his class during the Woodstock High School commencement ceremony Saturday, May 16, 2015. 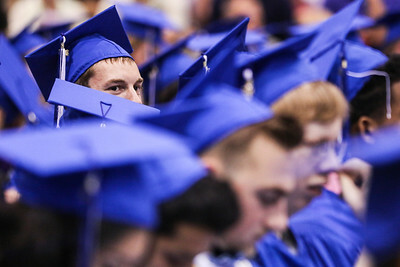 Sarah Nader- snader@shawmedia.com Graduates attend the Woodstock High School commencement ceremony Saturday, May 16, 2015. 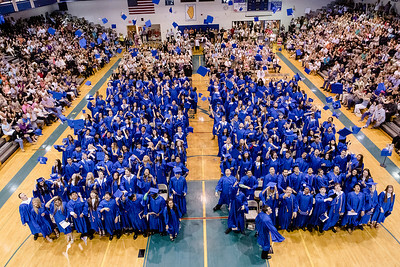 Sarah Nader- snader@shawmedia.com Graduates throw up their caps during the Woodstock High School commencement ceremony Saturday, May 16, 2015. 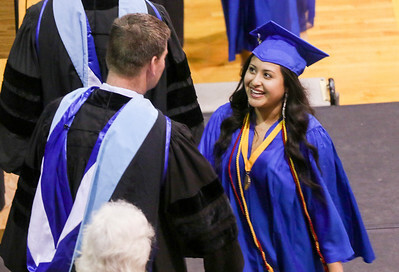 Sarah Nader- snader@shawmedia.com Valery Martinez receives her diploma during the Woodstock High School commencement ceremony Saturday, May 16, 2015. 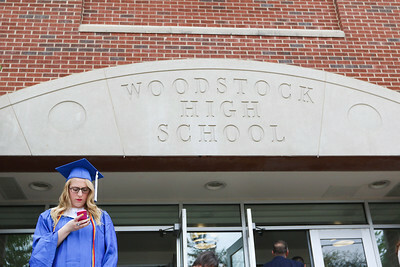 Sarah Nader- snader@shawmedia.com Abi Wielontek checks her phone before the Woodstock High School commencement ceremony Saturday, May 16, 2015. 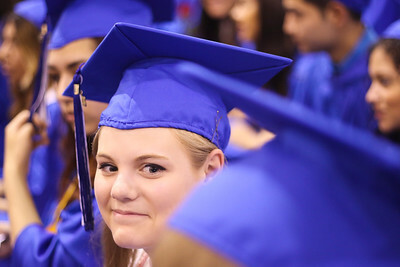 Sarah Nader- snader@shawmedia.com Daria McConnell waits with her classmates before the Woodstock High School commencement ceremony Saturday, May 16, 2015. McConnell plans to study nursing at Western Illinois University after high school. Sarah Nader- snader@shawmedia.com Demonte Samuelson is running late before the start of the Woodstock High School commencement ceremony Saturday, May 16, 2015. 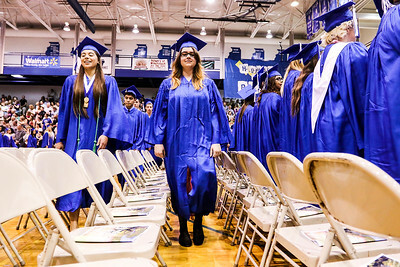 Sarah Nader- snader@shawmedia.com Karen Gillespie walks to her seat during the Woodstock High School commencement ceremony Saturday, May 16, Gillespie plans to study culinary arts at McHenry County College after high school.